The European eel is a critically endangered species. However, thousands are killed passing Ardnacrusha hydroelectric station on the Lower River Shannon each year, despite a ‘trap and transport’ scheme operated by the ESB. This is a largely unseen problem as eels migrate at night during storms and floods, and dead eels are washed away quickly and/or eaten by predators. The Lower River Shannon is also a very large, deep and murky tidal river so most of these eels are never seen. In Ireland hydroelectric stations are now the main threat to the survival of this species, with dams blocking the upstream migration of elvers and turbines killing downstream migrating silver eels. It has been estimated that 47.5% of the freshwater habitat available to the European eel in Ireland is located above hydropower dams so these dams are major threat to this species. The ESB do operate a ‘trap and transport’ programme to move eels around their dams – but this approach is both inefficient and unsustainable. Less than 30% of the eels are moved but the operation entails excessive costs. Moreover, silver eels are held for long periods and physically handled several times. This is likely to damage and stress the eels and cause significant sub-lethal mortality. Indeed, when commercial eel fishing took place at Killaoe it is known that many continental buyers were reluctant to purchase live Killaloe eels because of their low survival rates on the trip back to mainland Europe. This is because the eels were severely impacted on as a result of being held in coghill nets against the full flow and pressure of the large River Shannon. Now these eels are released below the dam and counted as escapement. According to ESB’s own figures, up to 25% of the eels passing the turbines are killed perhaps representing up to 20,000 critically endangered eels per year. However, this is almost certainly an underestimate and the turbine passage mortality rates published by the ESB do not take into account the disproportionate impact on the large females carrying millions of ova. Many eels also die days later and this delayed mortality cannot be accurately estimated by radio tagging. See the video above of silver eels found below Ardnacrusha hydroelectric station on the Lower River Shannon during December 2016. Many of the turbine impacted eels are still alive when found. The months of October, November and December 2016 were very dry months with rainfall levels in the Shannon catchment well below average – indeed the lowest in decades. This meant that there was not always night-time generation. During November the ESB typically stopped generating at 8pm and this would have prevented silver eels moving downstream. Similarly there was not always night-time generation during December. This is also a significant impact on the eels – causing delay and stress and many of these eels could revert again to yellow eel stage and not migrate until next season. We need an ‘eel generation protocol’ where water is managed to help migrating eels at the key periods. Turbines should be turned off at night when eels are migrating – but when this occurs water needs to be spilled overnight though spillways, sluices (and perhaps the shipping lock) to allow eels to pass downstream safely. We need new fish passes and bypasses on the Shannon and sustainable water management. It is clear that the money spent on trap and transport would be better invested in a permanent bypass system and new fish passes, which would also benefit other migratory species (i.e. salmonids and lampreys). A licencing system for hydroelectric stations such as Ardnacrusha also needs to be introduced in Ireland. This station has to be assessed for its compliance with the Water Framework Directive and Habitats Directive. Ireland made the choice to ban traditional eel fishing – which employed hundreds of fishermen – to allow this carnage to continue. Traditional eel fishing can be sustainable and maintains the vital link between communities and the eel and this can help drive conservation. Killing critically endangered eels in turbines is just waste and should be a wildlife crime. 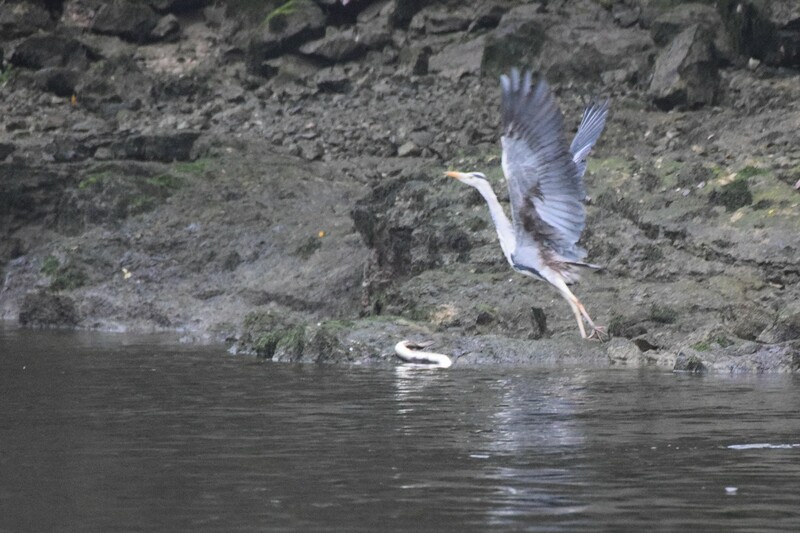 Grey heron and dead/dying silver eel in the tailrace of Ardnacrusha hydroelectric station, October 2016. We believe that it is important to show this problem of turbine passage mortality and call on anyone who finds turbine killed eels to photograph them and make this major problem visible. There are 25,000 hydroelectric stations across Europe affecting eels like this and threatening the survival of this critically endangered species. For further reading see this post. Also visit the Ecofact YouTube channel to view other eel related videos.